Eldrick Tont "Tiger" Woods is a professional golfer on the PGA Tour. With 14 major championships and 79 PGA Tour victories, Woods is one of greatest golfers of all time. Woods has been awarded the PGA Player of the Year a record 10 times and has been on top of the money list nine times. In 2009, Woods became the first athlete to reach $1 billion in career earnings, according to Forbes. Woods experience a downturn in his career following a tumultuous end to his 2009 season. A car accident the night after Thanksgiving led to revelations of infidelities in his marriage to Elin Nordegren. Woods took a leave of absence from the PGA Tour, eventually returning at the 2010 Masters. He went winless in the 2010 and 2011 seasons, before ending his drought with a victory at the 2012 Arnold Palmer Invitational. Tiger Woods was born on Dec. 30, 1975, in Cypress, Calif. His father, Earl Woods, was African American, Chinese and Native American and his mother, Kultida, is from Thailand and of Chinese, Thai and Dutch ancestry. Because of his parents' ancestry, Woods refers to himself as "Cablinasian." (Caucasian, Black, American, Indian and Asian). Woods was raised Buddhist, a religion that he stated he lost track of during his 13-minute apology on Feb. 19, 2010. His parents discovered their son's talent for golf at a young age, and he played the sport before the age of 2. Woods gained national attention at 2 when he appeared on "The Mike Douglas Show," defeating comedian Bob Hope in a putting competition. At the age of 3, Woods shot a 48 over nine holes at the Cypress Navy golf course. He was featured on the television show "That's Incredible!" at 5. As a child, Woods won the Junior World Championships six times. At the age of 11, Woods was able to defeat his father for the first time on the golf course. He attended Western High School in Anaheim, where he won the U.S. Junior Amateur Champion three consecutive years. Woods was the youngest winner of the event and the only amateur to win on multiple occasions. Woods attended Stanford University on a golf scholarship and enrolled in the fall of 1994. He wasted no time living up to the hype, winning his first collegiate event at the William H. Tucker Invitational. During his two years at Stanford, Woods was named a two-time NCAA first team All-American, two-time first team all-Pac-10 Conference and the Pac-10 Player of the Year. As a college student, Woods competed in the 1995 Masters. He was the only amateur to make the cut and finished 41st for the tournament. At the age of 20, Woods became the first golfer to win three consecutive U.S. Amateur titles. After two years at Stanford, Woods decided to leave school and turn professional. Tiger Woods became a professional golfer in August 1996 and immediately signed a $40 million contract with Nike and a $20 million deal with Titleist. Woods made his professional debut at the Greater Milwaukee Open on Aug. 29, 1996, tying for 60th place. Woods won his first PGA tournament on Oct. 6, 1996, at the Las Vegas Invitational, defeating Davis Love III in a playoff. Two weeks later, Woods edged Payne Stewart by one stroke at the Walt Disney World/Oldsmobile Classic. His two victories and splash on to the PGA scene was enough to earn Woods the 1996 PGA Tour Rookie of the Year Award, and he was named Sports Illustrated's 1996 Sportsman of the Year. Woods' first shot playing in a major since turning professional was at the 1997 Masters. He won the tournament by shooting 18 under par, winning by a record 12 strokes. The 21-year-old became the youngest player to win the Masters and the first African American to win the event. A victory at the GTE Byron Nelson Golf Classic a month after the Masters helped Woods rise to the top of the Official World Golf Ranking. It took only 42 weeks as a professional for Woods to become the top-ranked golfer in the world, the fastest to achieve such a feat. Woods was named the 1997 PGA Player of the Year. Woods suffered a slump the following year with his only victory coming at the Bell South Classic on May 10, 1998. The issues with his swing were worked out and Woods bounced back, starting off with a win at the Buick Invitational on Feb. 14, 1999. After scoring victories at the Memorial and Motorola Western Open, Woods won his second major championship, winning The Tour Championship by one stroke over Sergio Garcia. Woods closed out 1999 with four consecutive victories, including the PGA Championship. His eight victories were more than enough to earn Woods PGA Tour Player of the Year and Associated Press Male Athlete of the Year honors. Woods kicked off 2000 with his fifth consecutive victory, winning the Mercedes Championships. At the AT&T Pebble Beach National Pro-Am, Woods trailed by eight strokes before rallying back. Over the final four holes, Woods recorded an eagle and two birdies to win his sixth consecutive tournament by two strokes. At the 2000 U.S. Open at Pebble Beach Golf Links, Woods won by a record 15 strokes over Ernie Els and Miguel Angel Jimenez. It was the largest victory margin in a major championship, eclipsing Old Tom Morris' previous record of 13 strokes at the 1862 British Open. Woods' victory is regarded by some as one of the greatest performances in golf history. With a 19 under par at the 2000 Open Championship at St. Andrews, Woods -- at 24 -- became the youngest person to win all four major championships. It was the lowest score to par for any major championship. Woods won his third consecutive major championship at the 2000 PGA Championship, defeating Bob May in a three-hole playoff. He became just the second golfer to win three majors in a season. Woods wrapped up the season with victories at the NEC Invitational and the Bell Canadian Open. Of the 20 events Woods participated in, he finished in the top three 14 times and won nine tournaments. At the 2001 Masters, Woods defeated David Duval by two strokes, becoming the first player to hold all four major championship titles at the same time. The accomplishment would later be nicknamed the "Tiger Slam." Woods repeated as Masters champion in 2002, joining Nick Faldo and Jack Nicklaus as the only golfers to win back-to-back championships. Woods won his second U.S. Open and eighth major championship at Bethpage Black in New York, defeating his rival Phil Mickelson by three strokes. His attempt for a third consecutive major championship came up short at the Open Championship, tying for fourth place at 1 over. Woods erased a five-stroke deficit in the final round at the PGA Championship but finished in second at 9 under, one stroke behind Rich Beem. Over a span of just under three years, Woods went without a win at a major championship. During this span, Woods would win 10 tournaments but his streak of 264 weeks as the top-ranked golfer came to an end in September 2004 when Vijay Singh moved to the top of the rankings. After just one victory in 2004 (at the Accenture Match Play Championship), Woods started off 2005 on a winning note with a win at the Buick Invitational. He ended his majors drought at the 2005 Masters, earning his fourth green jacket after defeating Chris DiMarco in a playoff. Woods reclaimed the world's top ranking after winning the Open Championship by five strokes over Colin Montgomerie. He closed out 2005 with a win at the American Express Championship and finished on top of the PGA Tour money list for the first time since 2002. Tragedy struck Woods in 2006 when his father and mentor, Earl, passed away at the age of 74 from prostate cancer. Woods left the PGA Tour for nine weeks to deal with his loss, returning at the 2006 U.S. Open. The time away from the golf course was evident as Woods missed the cut for the first time as a professional at a major, ending his streak at 39. Woods was back on track in time for the 2006 Open Championship, defending his title with a two-shot victory over DiMarco. He dedicated his victory to his father, shooting 18 under, one stroke behind his record-setting score at the 2000 Open Championship. At the 2006 PGA Championship, Woods won by five strokes over 2003 winner Shaun Micheel, his first PGA Championship since 2000 and second victory at Medinah Country Club. Woods started off the 2007 season with his seven consecutive PGA Tour victories, winning the Buick Invitational for the third straight year. Despite being in the hunt on the final day, Woods finished tied for second at the 2007 Masters, two strokes behind winner Zach Johnson. He would also finish tied for second at the 2007 U.S. Open, one stroke behind winner Angel Cabrera. Woods was finally able to get over the hump at the 2007 PGA Championship with a two-shot victory over Woody Austin. It marked the second time Woods had won the PGA Championship on back-to-back occasions (1999-2000, 2006-2007), the first golfer to achieve such an accomplishment. Woods cemented his victory in the inaugural FedEx Cup with wins at the BMW Championship and The Tour Championship, the final two events of the competition. Woods won the Buick Invitational for the fourth consecutive year and fifth time in six years to start the 2008 season, winning by eight strokes. After another second-place finish at the Masters, Woods underwent left knee surgery for the third time. The operation sidelined from the PGA Tour for two months. He returned at the 2008 U.S. Open and struggled in the first round of the tournament, shooting 1 over par and falling four strokes off the lead. Woods moved within one stroke of the lead after a second round that saw him connect on five birdies and an eagle. Woods took the lead after 54 holes, heading into the final round as he looked to improve to 14-0 when having at least a share of the lead in a major championship. However, Woods needed a 12-foot put on the 18th hole to force a playoff with clubhouse leader Rocco Mediate. In the 18-hole playoff, both Woods and Mediate shot par, forcing sudden death. Woods won the championship on the first sudden death hole. Throughout the tournament, Woods favored his left leg and it was revealed on June 18, 2008, that he needed reconstructive anterior cruciate ligament surgery on his left knee. Woods also said he suffered a double stress fracture in his left tibia while rehabbing from his earlier knee injury. Woods was sidelined the rest of the 2008 season, causing a decline in television ratings for the PGA Tour. After an eight-month layoff, Woods returned at the WGC-Accenture Match Play Championship on Feb. 25, 2009. Woods defeated Brendan Jones 3 and 2 in the first round before losing to Tim Clark, 4 and 2. Woods' first victory since his return came at the Arnold Palmer Invitational, rallying from a five-stroke deficit heading into the final round. Woods made a 16-foot birdie put on the final hole to defeat Sean O'Hair by one stroke. While winning six tournaments in 2009 and the FedEx Cup, Woods had marginal success at the major championships. For just the second time in his professional career, Woods missed the cut at a major at the 2009 Open Championship. At the 2009 PGA Championship, Woods blew a two-stroke lead in the final round of the tournament, losing to Y.E. Yang by three strokes. Woods finished the year on a high note at the 2009 Presidents Cup, winning all five of his matches. Woods was paired with Steve Stricker and he defeated Yang in the singles competition, clinching the cup for the United States. Woods won the JB Were Masters in Melbourne, Australia, in November 2009, his first victory on the PGA Tour of Australasia and his final event of the year. After taking four months off from professional golf due to personal issues related to his marriage, Woods returned to the tour in April 2010. In his first tournament after the break, the Masters, he finished tied for fourth place. He also finished tied for fourth at the U.S.Open but would go on to endure a tough 2010 season and go winless for a calendar year for the first time in his professional career. Results included his worst four-round finish as a pro, when he shot 18 over par and tied for 78th place (second-to-last) at the WCC-Bridgestone Invitational in August. By October, Woods had lost the world's No. 1 ranking to Lee Westwood. 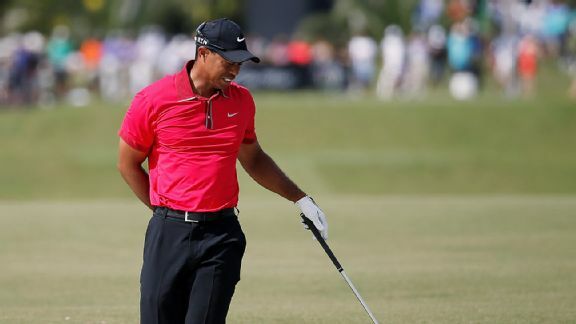 Woods' 2011 season got off to a slow start, with a 44th-place finish at the Farmers Insurance Open and a second-round loss at the WGC Accenture Match Play Championship. However, he was in contention on the final day at the Masters, taking the lead at one point, before finishing 4th for the second consecutive year. A knee injury he aggravated during that event forced him to miss a month of action. He returned at The Players Championship, but withdrew after just nine holes. He was 6-over-par at the time of his withdrawal. After missing the U.S. Open and the British Open (due to the injury), Woods then dismissed his long-time caddie Steve Williams in July of 2011, ending a 12-year relationship during which he won 72 tournaments worldwide and 13 majors. Woods finally ended a two-year winless drought at the 2011 Chevron World Challenge, beating Zach Johnson by a stroke to top the 18-player field. The win came the same week Chevron announced it was ending its title sponsorship of the event. The following season, Woods opened his season at the Abu Dhabi HSBC Golf Championship, where he entered the final round with a share of the lead. However, he shot a final-round 72, falling to Robert Rock by two strokes. In March, he nearly broke through at the Honda Classic. His final-round 62, the best final round score of his career, vaulted him into contention, but Rory McIlroy ended up holding on for victory. Woods suffered a set back the next week, when an injured Achilles forced him to withdraw during the final round of the WGC-Cadillac Championship. He returned healthy two weeks later at the Arnold Palmer Invitational, and followed a first-round 69 with a 65 on Friday, taking a share of the lead. Woods shot 71-70 on the weekend, earning a 5-stroke victory, his first on the PGA Tour in more than two years. Woods added wins at the Memorial and the AT&T National, passing Jack Nicklaus for second on the PGA Tour's all-time wins list. He opened his 2013 PGA Tour season with a win at the Farmers Insurance Open -- following a missed cut in Dubai on the European Tour -- marking his seventh win at the event. He later defended his Arnold Palmer Invitational title, giving him eight wins at the event. His career total stands at 79 wins, second only to Sam Snead. Woods has struggled in six Ryder Cup appearances, with a record of 13-17-3. He made his Ryder Cup debut in 1997 and earned just 1½ points. Woods was a member of the 1999 team that defeated The Europeans 14½-13½. In 2004, Woods was paired with rival Phil Mickelson but lost both matches. Woods was unable to compete in 2008 because of a knee injury. In the 2010 Ryder Cup at Celtic Manor, Woods' 3-1 record included a final-day singles win, but the U.S. was defeated by Europe 14½-13½. Woods had his worst Ryder Cup appearance in 2012 at Medinah, going 0-3-1 overall and being benched for a session (on Saturday) for the first time in his career. Woods' only half-point came from his singles match, which was the last of the day and was finished after Europe had already completed its record comeback and clinched the Cup. Woods is 20-14-1 in Presidents Cup play. The United States has won the Presidents Cup five out of the seven years Woods has participated in, most recently in 2011, when Woods went just 2-3, but clinched the title for the U.S. in singles play. Tiger Woods was introduced to former Swedish model Elin Nordegren in 2001 by fellow golfer Jesper Parnevik at the Open Championship. In November 2003, Woods and Nordegren were engaged and the couple married on Oct. 5, 2004, in Barbados. Woods and Nordegren have two children together; Sam Alexis Woods was born on June 18, 2007, and Charlie Axel Woods was born on Feb. 8, 2009. Woods and Nordegren divorced in August 2010, and the two share custody of the children. On Nov. 25, 2009, the National Enquirer leaked a story that was planned for the Dec. 7 issue that claimed Woods had been cheating on his wife with Rachel Uchitel, a nightclub manager. Uchitel denied the allegations. On Nov. 27, 2009, Woods was involved in a car accident outside his home at Isleworth, crashing his Cadillac Escalade into a fire hydrant at 2:30 a.m. The accident caused $3,200 in property damage and $8,000 in damage to his SUV. According to the police, Nordegren broke the back window with a golf club and pulled Woods out of the car. Woods faded in and out of consciousness as he was found lying on the ground and bleeding from his mouth. He was transported to Health Central Hospital in Ocoee, Fla., and was listed in "serious" condition but was released later in the day. The Florida Highway Patrol fined Woods $164 for reckless driving. Woods released a statement on Nov. 29, 2009, taking responsibility for the accident and that Elin "acted courageously when she saw I was hurt and in trouble." On Nov. 30, 2009, Woods pulled out from the Chevron World Golf Challenge in Thousand Oaks, Calif., a tournament that benefits his own charity. Woods also stated that he wouldn't be participating in any tournaments for the rest of the season. On Dec. 1, 2009, Jaimee Grubbs, a 24-year-old reality show contestant and cocktail waitress, said she slept with Woods in 2007. The two allegedly met in April 2007 and Grubbs claims to have hundreds of texts from Woods and a Nov. 24 voicemail -- one day before the National Enquirer story leaked. In the voicemail, Woods asks Grubbs to take her name off her voicemail because he suspected Elin would be calling. US Weekly released the voicemail Woods left for Grubbs on Dec. 2, 2009. Hours after the voicemail was released, Woods released a statement admitting to letting his family down and regretting "those transgressions" with all of his heart. Over the span of the next week, nearly a dozen women came forward to claim they had slept with Woods during his marriage. On Dec. 11, 2009, Woods released a statement on his website stating would be taking an indefinite leave from golf in order to spend time with his family and repairing his marriage. Accenture, one of Woods' sponsors, announced on Dec. 14, 2009, that it was cutting ties with Tiger because the golfer is "no longer the right representative." AT&T followed suit on Dec. 31, 2009, ending its sponsorship with Woods. Gillette announced it wouldn't feature Woods in its marketing campaign while Woods took time off from the sport. Swiss watch maker Tag Heuer followed suit and announced it wouldn't feature Woods in its advertising campaign for the foreseeable future. Woods entered therapy on Dec. 31, 2009, reportedly in Hattiesburg, Miss., to deal with what he later described as the "issues I'm facing." Electronic Arts announced on Jan. 4 that it would stand behind Woods and continue with the release of "Tiger Woods PGA Tour Online." On Feb. 17, Woods' agent, Mark Steinberg, announced that Woods would speak publicly for the first time since the accident at the TPC Sawgrass clubhouse in front of a small group of associates, friends and business partners on Feb. 19. The speech coincided with the Accenture Match Play Championship. During his 13-minute televised statement, Woods apologizes for his infidelity against his wife, Elin, and reaffirmed his faith in Buddhism to help his recovery. Following his televised statement, Woods traveled to Arizona for a week to take part in family counseling. Nike brand president Charlie Denson announced on Feb. 25 that the company would continue to support Woods and that it looked forward to his return to the sport. On Feb. 26, Gatorade became the third sponsor to end its endorsement with Woods but announced it would continue its relationship with the Tiger Woods Foundation. Gatorade had earlier discontinued its "Tiger Focus" drink, a decision that was made before Woods' accident. Woods announced his return to professional golf on March 16, ending his four-month hiatus to participate in the Masters at Augusta National. ESPN and The Golf Channel were granted the first interviews with Woods on March 21, with each network getting five minutes and no restrictions on the questions. When asked by Tom Rinaldi about specifics regarding the accident, Woods stated, "Well, it's all in the police report." "Beyond that everything's between Elin and myself and that's private." Nordegren filed for divorce from Woods months later, and in August 2010 the divorce was finalized, with the two sharing legal custody of the children. Prior to his personal issues, Woods was the most marketable athlete in sports, earning over $100 million a year in endorsement deals. Since his professional debut in 1996, Woods has been signed with Nike and is the face of the Nike Golf brand. His contract with Nike is rumored to be worth more than $100 million. As part of his endorsement deal with Electronic Arts, Woods has his own video game franchise in "Tiger Woods PGA Tour." Woods also has endorsement deals with Upper Deck, NetJets, Tatweer: The Tiger Woods Dubai and TLC Laser Eye Centers. Woods previously had endorsement deals with Accenture, Gatorade, TAG Heuer, Golf Digest, Gillette and AT&T, all of whom parted ways with Woods in the years following his infidelity scandal. Woods, along with his late father, Earl, formed the Tiger Woods Foundation in 1996. The foundation focuses on character development, career exploration, scholarships and grant-making programs for young people. As part of the Tiger Woods Foundation, Woods began hosting golf clinics in 2003 for youth, ages 7-17. The Tiger Jam is an annual fundraising concert to benefit the Tiger Woods Foundation, along with the VH1 Save the Music Foundation and the GRAMMY in the Schools program. In 2006, Woods opened the Tiger Woods Learning Center in Anaheim, Calif., a 35,000-square-foot education facility. Woods is the host of the Chevron World Challenge each December to benefit Woods' charities. Tiger Woods is responsible for some of the greatest moments in Masters history, including his groundbreaking win at Augusta in 1997.